Red Filter For Colour Correction in Blue and Tropical Water. Iridium lens for superior optics and scratch resistance. The Aqua red colour corrects in Tropical and Blue waters from 3 to 25m or 10 to 80 feet. The filter will securely slide onto the Hero3/4 Dive Housing and can be installed and removed in less than a second. The pressure fit is very snug but just in case a tether is included. 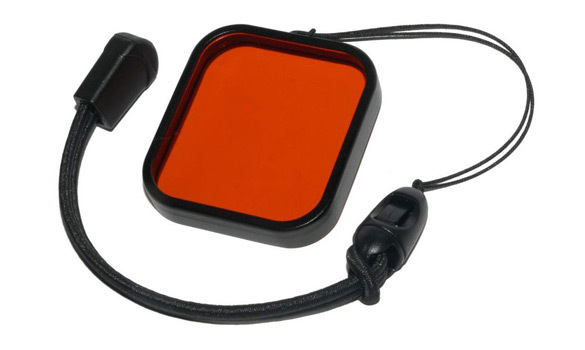 The point of a red filter is to compensate for red light loss which takes place under water. The reason being at about 10 feet there is no red light. The GoPro Hero3’s white balance is thrown off because of the red light loss causing the camera to record colours which are too blue or too green. A red filter compensates for the red light loss tricking the camera into recording natural colours the way you see them.